Climate control is a very demanding market with diverse operating conditions, custom performance expectations and bottom-line accountability. An efficient climate control air compressor is essential for ensuring that an HVAC system produces clean, dry, low-oil (<2 ppm) air. Quincy Compressor offers complete climate control compressor systems that can meet your unique air system demands, regardless of your industry or application. 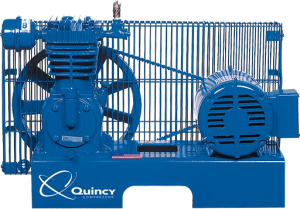 Of course, consistently exceeding these stringent expectations has positioned Quincy Compressor as the leader in this market. Quincy Climate Control Systems are easy to quote, order, install and service. Our climate control compressors are manufactured to meet the same high standards for quality and reliability that have made us an industry leader for nearly 100 years. Our climate control air compressor options include our Simplex and Duplex Splash Lubricated Base-Mount models that are equipped with features such as cast-iron cylinders, crankcase, crankshaft and flywheel, stainless steel reed valves, beveled gap piston rings and an oil carryover of 2 ppm or less. They also include enclosed belt guards and pressure switches as standard features. The Simplex model offers an optional starter, while the Duplex enables you to choose the optional Duplex Control Panel. You can also select our Simplex and Duplex Splash Lubricated Tank-Mount climate control compressors. Our tank models include ASME coded and National Board approved receivers as well as ASME pressure relief valves, all in addition to pressure gauges, manual tank shutoff and manual tank drains. In addition to the starter and Duplex Control Panel, optional features include refrigerated dryers, automatic tank drains, PRV stations and isolation pads. Combination and non-combination duplex panels featuring a two-source power supply are also available. 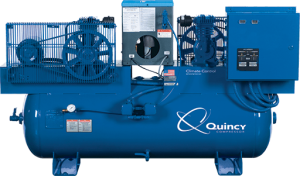 If your existing climate control air compressor fails, a Quincy climate control replacement package can provide a hassle-free, cost-effective solution. Our replacement packages are manufactured to the same high standards as our other air compressor products, which means you’ll sacrifice nothing in terms of quality and reliability. Replacement packages include a durable cast iron compressor and special lap gap rings. You also get the benefit of a specially designed and engineered base plate that can be mounted to the top of any compressor tank top plate, which saves time and eliminates the need to purchase additional replacement parts. The authorized Quincy Compressor distributor in your local area will be happy to work with you and assist you in exploring all of your climate control compressor options. You can also contact us directly if you would like more information about any of our air compressor products. Keep your system running great by learning more about reciprocating/piston air compressor oil and maintenance. Need help sizing your system?